THE REVIEW: Fairly quickly into this film, I thought to myself, “Is this a game of Whose Line Is It Anyway?, the show where everything is made up and the points don’t matter?” Because that sure seems to be the case here. Even for someone who knows very little about earthquakes or seismology, San Andreas seems to take many liberties with truth and fact in order to stretch it and create a fantasy apocalyptic scenario that’s billed as a possible realistic occurrence. Usually, made up science for the good of the film and entertainment value doesn’t bother me. I have a high level of suspension of disbelief as long as it still brings the thrills and excitement. That is the source of many of my complaints about San Andreas. It isn’t that the film is boring or fails to get your adrenaline coursing, it’s that they attempted to base it in scientific fact. Dr. Lawrence Hayes (Paul Giamatti) and colleague Dr. Kim Park (Will Yun Lee) play seismologists who are trying to discover a method to predict earthquakes before they happen. While Ray Gaines (Dwayne Johnson) and his family are the central focus of the film, it is all built upon concepts put forth by the “scientists”. Even having lived in California for just under four months, I knew the earthquake procedure is to drop, cover, and hold on. This safety procedure is reiterated multiple times by Dr. Hayes but everyone else in the entire state seems to forget the basic tenant of earthquakes they learn as children. I never even experienced an earthquake in my time out there and I still know what to do in that event. Part of it might be panic and forgetting it in the moment (combined with trying to make a good-looking film), but I find it hard to believe everyone would just run around, arms-flailing, in a situation like this. A lot of explanation was also given as to why a magnitude 9.5+ could actually occur along the San Andreas fault, most of which seemed hand-wavy and made up. Sure enough, one of the first google results popped up this site for the US Geological Survey explains that earthquakes larger than magnitude 8.3 are extremely unlikely in California. My problem with San Andreas isn’t that they used clearly false and implausible scenarios for a massive earthquake; my problem is they tried to pass them off as real. If the film didn’t try as hard and just focused on tense, action-filled moments, I probably would have enjoyed the film a lot more than I did. All these complaints aside, I can’t deny that the film was still pretty entertaining. Despite the ridiculous and unbelievable science, my adrenaline still picked up and my heart was pounding for large portions of the film. The story and characters (especially the characters) are quite bland and one-dimensional, but for most of the film it doesn’t matter. They’re just pieces in a giant game being moved around the make things flow. For action scenes, this brings a lot of excitement and thrills. For quieter moments and the actual “story” behind the film — Ray and Emma (Carla Gugino) are getting a divorce and their daughter Blake (Alexandra Daddario) meets Ben (Hugo Johnstone-Burt) — this problem is amplified. 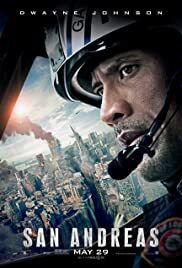 THE TAKEAWAY: San Andreas makes for a good action/summer film but grossly inaccurate science, poor story, and weak characters limit the enjoyment and don’t lend itself to a re-watch.